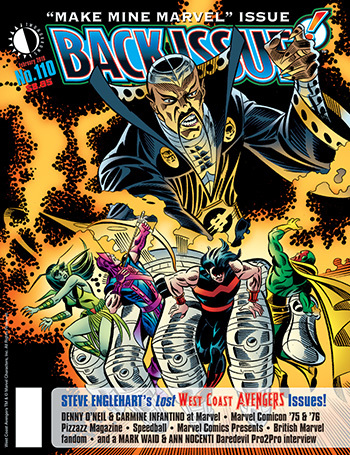 Back Issue #110 is a “Make Mine Marvel” issue, cover-featuring Steve Englehart’s “lost” issues of West Coast Avengers! Plus: Denny O’Neil and Carmine Infantino’s Marvel work, a Mark Waid/Ann Nocenti Daredevil Pro2Pro interview, British Bronze Age Marvel fandom, plus histories of Pizzazz Magazine, Speedball, and the anthology Marvel Comics Presents. And go backstage of Marvel Comicon ’75 in a photo- and ephemera-packed retrospective. Featuring Tom DeFalco, Scott Edelman, Terry Kavanagh, Luke McDonnell, Marv Wolfman, and many more merry marching Marvelites! With a previously unpublished West Coast Avengers cover by Al Milgrom and Mike Machlan, it’s superbly edited by Michael Eury. This entry was posted in TNT on 19 January 2019 by Mr. Morrow.